Stella Artois proves yet again that a promo gift does not need to be expensive in order to attract the attention of potential customers. The pilsner brand wants to show their appreciation to their customers through this amazing in pack offer. In addition, this custom gift set accentuates the brand’s rich history and encourages customers to make that purchase. Whether you are a wine/beer expert or a novice drinker, we all know that a good glass affects the taste of wine/beer. And, Stella Artois’ distinctive malty – bitter pilsner is best to drink using their custom wine glass. The known brand uses lead-free glasses for their promotional wine glass. Also, the shape of the glass contributes to a positive drinking experience. Furthermore, Stella Artois prints their logo on their glasses to enhance their marketing campaign. The visible logo helps a lot with brand recognition. Why Do We Love Stella Artois’ Wine Glass Giveaway? Practical – In this set, customers receive items that complement each other. Pour the Stella Artois into the glass and voila! You’ve got yourself a brilliant combo. Also, the shape of the wine glass makes it perfect for other types of alcoholic drinks. Added value – A customer knows a good deal when they spot one. This promotion is a good example of a good buy; bringing home two items for a price of one. Customers will know that they will save money on this purchase because they get a quality gift for just doing their regular purchase. Boost sales – Definitely, this boosts Stella Artois’ sales because it’s a wonderful gift. These glasses are of high-quality hence it’s no wonder if customers would like to complete a whole set of it. For your own beer promotions, why not set up a collectible promo with different wine glasses and custom drinking cups with different shapes? Customisable – Stella Artois printed their logo on the glass to further brand exposure. This means customers will get to see the branding every time they use it. Also, the brand utilises a creative packaging to enhance their marketing campaign. 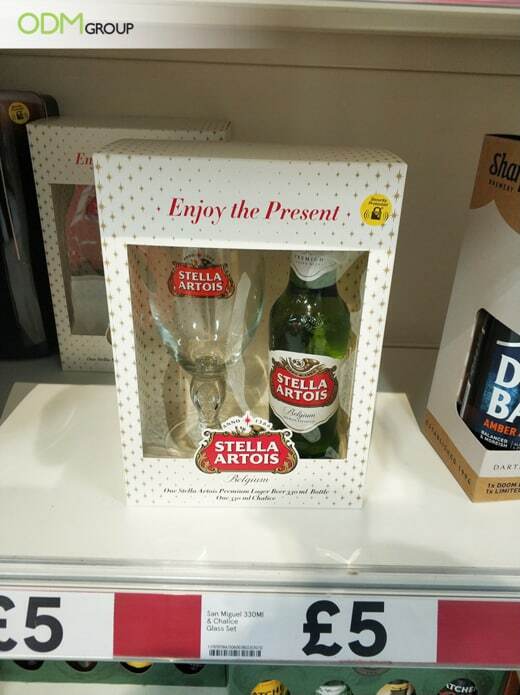 Overall, Stella Artois has produced a lot of great marketing gift packs but this one stands out on the shelf which improves their brand’s value and sales. The use of simple yet effective packaging and gift with purchase set their brand apart from competitors. Are you ready to create your own custom wine glass giveaway? Please feel free to contact the ODM team. Our product designers have extensive experience in marketing and manufacturing of custom branded merchandise. Our staff are always ready to answer your queries.